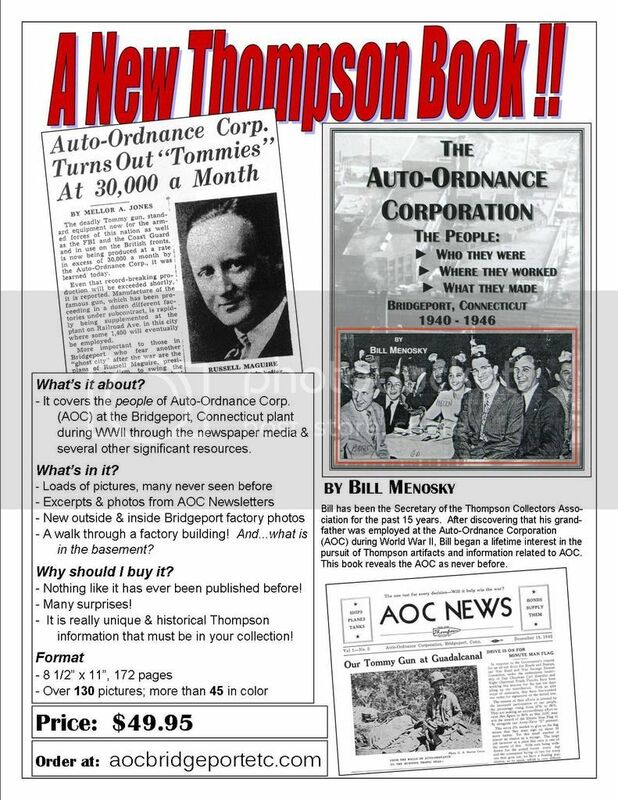 A new Thompson Submachine gun book!! who actually worked at the AOC Bridgeport plant or a surviving relative, allowed a different focus than just vintage print and photos. This is a close-up look at the Auto-Ordnance Corporation factory throughout World War II and shortly thereafter. I hope that you enjoy the book. Edited by aut-ord-co, 01 April 2015 - 11:32 AM. Bill, congratulation on your book. Is it possible to have the book signed by you that I just ordered ? Looking forward to reading about the WW2 AOC and learning more about the people that manufactured my Auto-Ordnance Bridgeport plant 1928A1. Edited by Bridgeport28A1, 29 March 2015 - 07:26 PM. Thanks for ordering the book. Absolutely will sign for you. I have always wanted to know more about the Bridgeport plant and operations. Oh, mine is ordered. Would you mind signing mine if you can please. Edited by full auto 45, 29 March 2015 - 07:36 PM. Congratulations! Looking forward to seeing it. I just ordered mine. If you can sign it, that will be great. Otherwise I'll get you to sign it next time I see you. Congrats on your book, I know it will be great. Everything you do is first class, I just placed an order for it. If you could sign it,,it would be great! Just ordered and look forward to reading your new book. Please sign mine as well. Congratulations on your book, I just ordered one also. If it is not too much trouble, a signed copy would be nice. Good luck with the sales! Bill, I ordered one too. Please sign it also. I have authored a few books myself and know how exciting it is to finally have it finished and to start selling copies. I have some questions about who did your printing etc. I will PM you if you don't mind. I too am patiently awaiting my copy. Another must have Thompson book! Interests:Thompson's and all other guns especially full auto's. Tried to order. I don't have pay pal. Can you send me an address to send a ck/mo to you ? Edited by wv1928, 31 March 2015 - 11:24 PM. Just ordered your book. Would like it signed thanks. I look forward to receiving my copy also. Just sent the order in and would like it signed too. By the time I get all these new books in Canada I'll have more invested in them than my first Thompson! Edited by canuck, 01 April 2015 - 02:49 PM. Awesome, looking forward to reading your new book. My book has been delivered! I will be busy reading for a while. edit: This is a great read on the AOC Bridgeport plant. I have discovered what is in the basement. Edited by Bridgeport28A1, 02 April 2015 - 04:16 PM. Just received mine. Dinner and a read tonight.